Most of us have seen Dan Pink’s TED talk on motivation. If you haven’t, go watch it via YouTube. I imagine Daniel Pink making an excellent lawyer (he is a lawyer) based on his ability to assimilate information and present everything succinctly and with excitement. 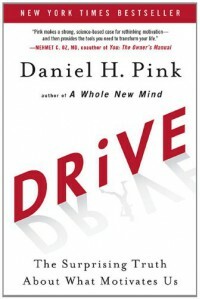 Pink’s main philosophies come from the findings of Edward Deci and Mihaly Csikszentmihalyi. The idea here is that we are driven by more than money and that we can become energized by our work. After he presents his studies, he presents his three core essentials: Autonomy, Purpose, and Mastery. What is particularly interesting is how everything can be applied to everyday life, including personal goals, relationships, and parenting. After reading this book, I’m viewing everything differently. Take for example, the new kindle paperwhite. It has a special section for kids that rewards them with virtual achievements based on their reading habits. Old school methodology says this sounds awesome. After reading what Daniel Pink has to say, I’m not so sure. Perhaps this is counter-rewarding, where the kids will read for 20 minutes and then stop once they’ve earned their reward. And maybe they’ll decide they’ll just stop because the reward isn’t worth it. Instead, they should read for intrinsic value and desire. Just something to think about. Thanks, Dan. So that’s why I’m giving this book five stars, because it has caused me to think beyond the binding. Excellent.